59 members and guests were greeted by our President Kate Dilks to the first meeting of 2018. It was also the meeting at which we had to pay our annual subscription. A reminder was given that all subscriptions MUST be paid by the February meeting at the latest. On December 11th, 2017, 49 members and guests had braved the snow and cold to travel to Lympne Castle for an excellent Christmas lunch. 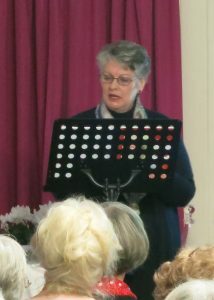 Our thanks go to Patricia Robinson for organising this event and to Mary Wheatley for the lovely table decorations. Please click on past events to read a more detailed report and see all the photographs. After the business part of the meeting – coffee time and a chance to catch up with friends, always an important part of any WI meeting! 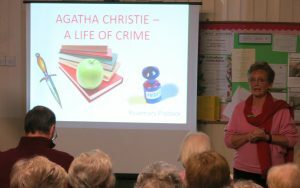 Kate introduced our speaker Rosemary Piddick who gave us a very interesting talk about Agatha Christie. Agatha was born in 1890 and grew up in an upper middle class Victorian family near Torquay. Although her elder brother and sister were educated at boarding school, she was educated at home in a somewhat lonely environment. So she invented imaginary friends. An interesting fact is that she appears twice on the 1911 census, once at her home in Torquay and also at the home of her grandmother in Ealing. This is first mystery in Agatha’s life as it is illegal to appear twice in a census! During the First World War she volunteered as a VAD at Torquay hospital and worked with a pharmacist where she gained a knowledge of poisons, always useful for a future crime novelist. In 1919 goaded by her sister she wrote her first novel The Mysterious Affair at Styles which was published by Bodley Head. In 1920 although, already engaged, she met and married Archie Christie . The next great mystery in her life was when she disappeared in December 1926 for eleven days. After a nation wide search she was finally found in Harrogate. Later after her divorce she met and married the archaeologist Max Mallowan who was 14 years her junior. However, on their marriage certificate his age was raised by a few years and hers was reduced. Another little mystery. Taking us through the following years of Poirot, Miss Marple and the Mousetrap ( opening night 25th November 1952) Rosemary revealed that our meeting was being held on the 42nd anniversary of Agatha’s death. Marjorie Mitchell gave the vote of thanks and Kate won the competition to devise a title for an Agatha Christie novel set in our locality.